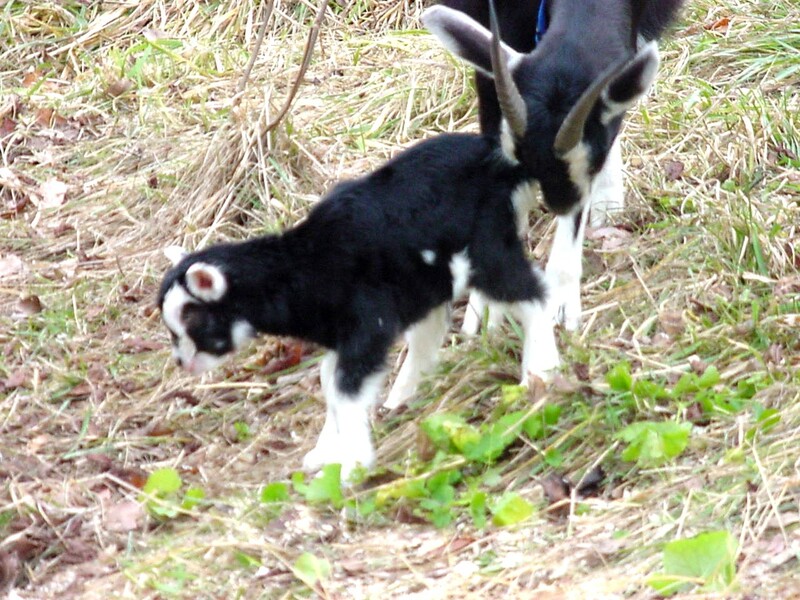 Doe goats get flower/plant names, buck kids just get convenient descriptive handles till they’re off to be processed. 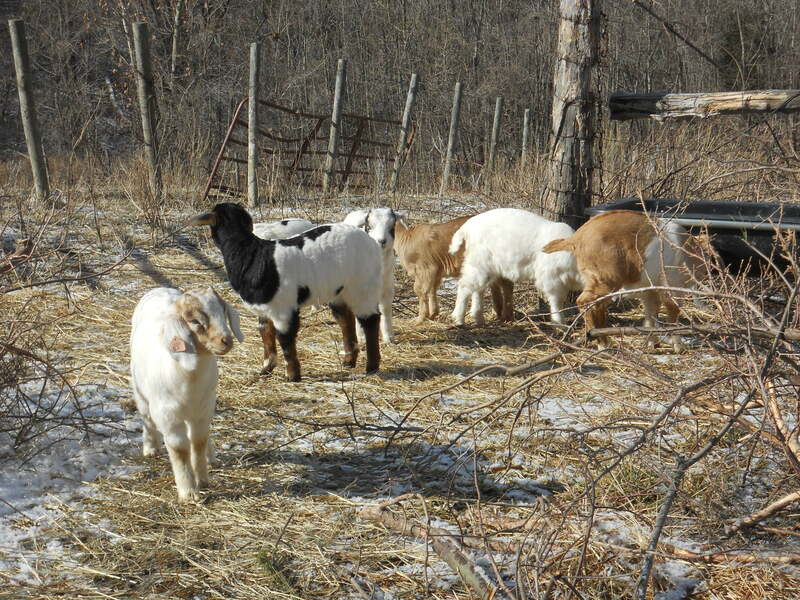 This season we’ve welcomed Ivy, Juniper, Lily, Lilac, Warda, Tulip & Zinnia, and their brothers, Curly, Moose, Brownie, Red, Ears, Legs and Fuzzy. One doe, with a black coat and bossy disposition, is named for a sometimes useful, sometimes poisonous genus of well-known plants. That’s Nightshade, my British Alpine doe, flock leader, great milker and hopefully soon to be a good mother. She has had a troublesome history, thru no fault of hers. When I bought her neither I nor the young couple who sold her knew she was bred. But just after Christmas, 2007, she bagged (suddenly? Or was I just not paying attention?) and kidded. I mention “perfect” because Nights herself has the double-teat defect that should result in doe kids being culled (processed for meat). But she was full-grown, bargain priced and I needed a companion for Columbine – depressed, left alone on a strange farm when her twin strayed. The kid, Pansie, throve wonderfully until 4 months old when she got caught in flexible electric fence and strangled. This was unspeakably sad. But Nightshade had to be milked, to ease her discomfort on top of the loss of her kid (that goats feel loss, and grieve, is very evident.) Her milk proved to be rich, sweet and abundant, and I began to see dairy as well as meat potential from my small flock (now including two weanling Boer x Tog does). Next breeding season, 2 promised lease bucks failed to appear, and by the time I got the loan of one from a neighbor, Nightshade was done cycling for the season. Columbine produced a healthy single buck kid, but Nights’ 08-09 breeding (and milking) season was wasted. So, Fall ’09, I bought Nobel (‘breeding for peace’), wh0 proved himself immediately, covering 4 does for 7 kids. Nightshade’s troubles were not over: she lost her doe kid which malpresented, then delivered a healthy buck. Ready for irony? 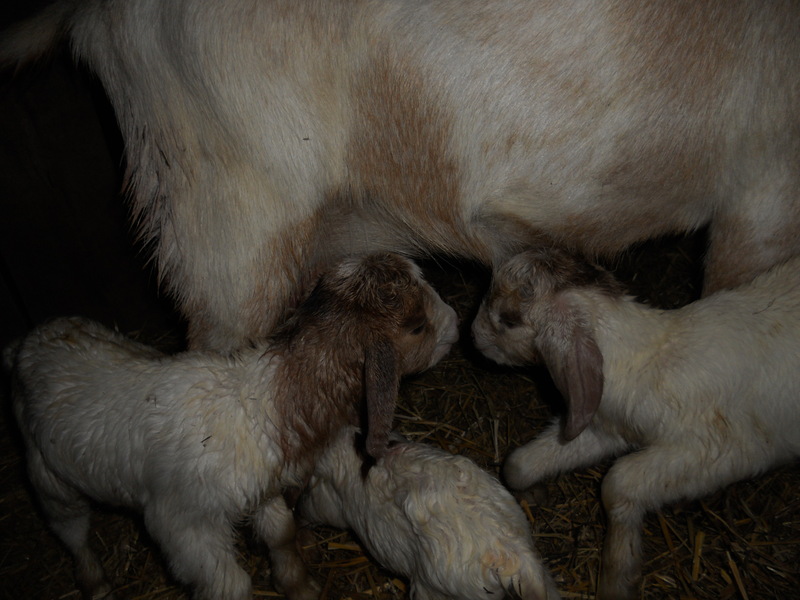 Two other does had twins, but their doe kids were culls: the dead kid was perfect (single teats). The buck fed up well on all that milk, and sold high. Then we had 4 months of Nightshade’s wonderful milk, fresh chevre, gelato, etc. Along with the other does, she was bred in Fall, but in mid-November, she miscarried. I wondered if that was it for the season: then in early December she bred back, putting her due date in early May. This all leads up to a big thanks. Colleen (a trooper at worming goats, drying kids, planting garlic and just generally loving farm reality) & her friend Peter came Sunday for a long delayed visit, to help with fence, hoof trimming, and an excuse to hike. They commented that Nightshade was spending a lot of time off away from the flock, lying down and browsing little. I had noticed this, but laid it to her being a little depressed that all the other does had kids and she didn’t. In fact I wasn’t sure the last breeding caught, she was looking so lean. 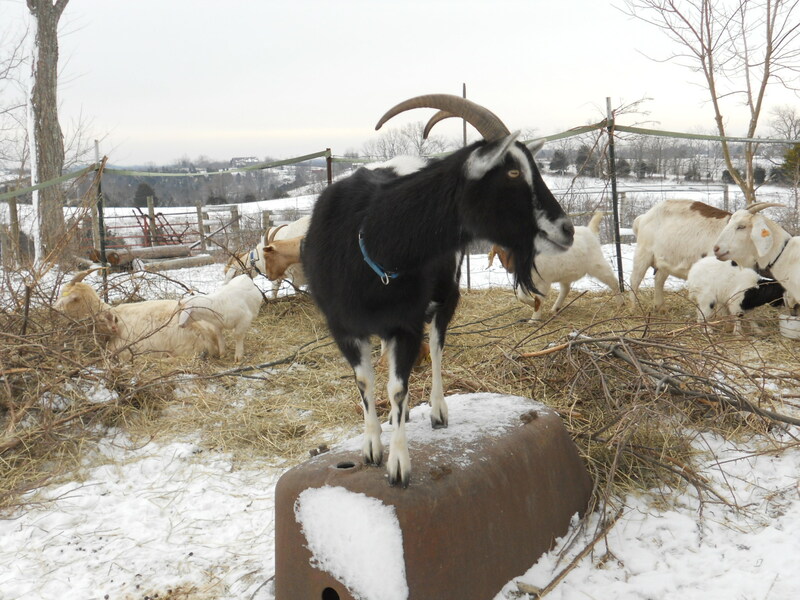 …but Nightshade, Official Watchgoat, has none of her own to guard. But their comment recalled something I’d read back before any of the does were breeding. This turns out to be early (mercifully) symptoms of ketosis, goats’ equivalent to toxemia of pregnancy. The developing kid makes heavy carb demands on the mother’s body, which may metabolize fat to compensate. It’s a risk on Winter feed, or when Spring grass is late, or low in carb content for lack of sunlight. And Nights is a more rangy build than the Boer and Boer x does, so has less fat to spare. The remedy at this stage is nothing drastic: just a 3-times daily tonic of molasses, Karo, corn oil and (you’ll love this) a traditional goat appetite stimulant and flavor treat, tincture of lavender. Nightshade slurps it with great appreciation, and since Sunday, has already picked up appetite, activity and spirits. It shows in a full rumen, which also makes her pregnancy apparent. And just yesterday she started bagging. I’m relating this now so, if there’s a successful kidding story 4 weeks from now, you’ll know how happy an ending it is. And Colleen & Peter will get due credit for attentiveness. 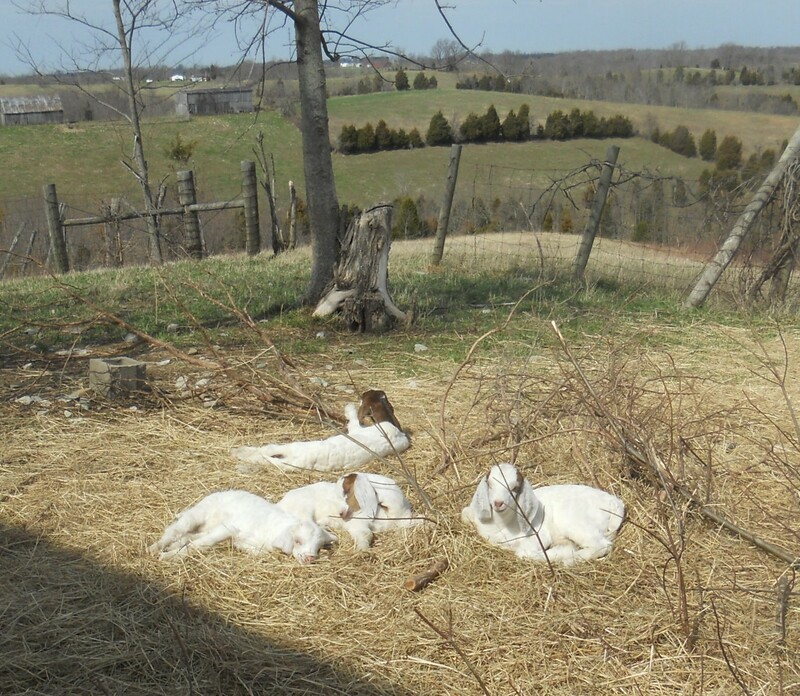 NB: Nightshade did not kid that Spring (11) but now, in January 12, she has two perfect doe kids, Pansie II and Violet. See Home page for details.